The lenses included in this package are compatible with both full frame sensor cameras, such as the Canon 5D Mark III, and with crop frame sensor cameras, such as the Canon 7D Mark II. Camera bodies are rentable separately. This package is ideal for weddings, events, portraits, and class assignments. • This flash requires 4 AA batteries to operate and they are not included. For extended use, attachment of the Canon CP-E4 battery pack is recommended (not included). You may also attach this flash to a Quantum battery pack with the help of the CZ cable. Note that you must still install 4 AA batteries into the flash even when using an external battery pack. • A flash foot is not automatically included with your rental. If a flash foot is needed, please select the option at checkout. • This flash does not include filter attachments. • This flash is not recommended for use with lenses wider than 28mm on full frame cameras (or wider than 18mm on crop frame cameras). Use of this flash with ultrawide lenses may result in unwanted shadows. • This lens is compatible with Canon EF mount cameras in both full frame and crop frame sensors. The focal length equivalent on crop frame sensors is 38.4-112mm. • This lens does not have built-in image stabilization. 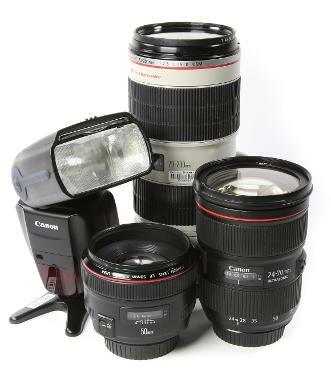 If you need image stabilization in this range, please see the Canon EF 24-70mm f/4L IS USM Lens.